The withdrawal of the party’s most likely candidate all but assures that Fianna Fáil will not nominate anyone for the election. 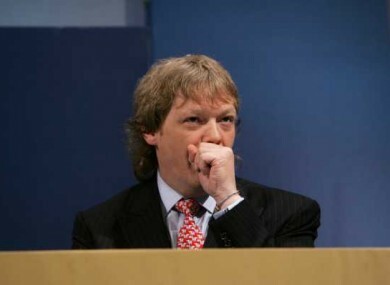 MUNSTER MEP Brian Crowley has pulled out of the running for Fianna Fáil’s presidential nomination – all but assuring that the party will not run a candidate in the October election. This afternoon, in a brief statement, Crowley said the party leadership “has demonstrated that it does not want an internal party candidate to contest the upcoming Presidential Election”. Crowley said that many members of the 36-strong Fianna Fáil parliamentary party – which would ultimately have been responsible for deciding the party’s election policy – had indicated they did not want to run a candidate. “It is very important to me that the status and dignity of the Presidential office not be diminished in any way,” he said. For that reason, I will not be a candidate for a party that continues to be divided on its electoral approach. So, with much disappointment, I do not now feel free to seek the Fianna Fáil nomination for the Presidential Election. Last week senior party figures including Willie O’Dea had confirmed they had advised Crowley, a four-time MEP for Munster and a former co-president of Fianna Fáil’s European Parliament grouping, against seeking the nomination. O’Dea and others were adamant that the party should instead focus on rebuilding itself in the wake of February’s general election, which saw its Dáil representation reduced from 72 to just 20. It could have spent up to €750,000 on its nominee’s election campaign. In a brief statement this evening, party leader Micheál Martin described Crowley as an “excellent parliamentarian” but added that the party’s process for deciding on an election strategy would not be changed. A six-member elections committee will meet next week to recommend an election policy, which will then be put to the parliamentary party for ratification. In light of Crowley’s withdrawal from the race, however, it is now likely that Fianna Fáil will not formally nominate a candidate of its own. A RedC opinion poll commissioned by Paddy Power had shown Crowley enjoying 13 per cent of the public vote – tied in third place with Fine Gael’s Gay Mitchell. Second preference data compiled by RedC indicated that with that level of support, Crowley would have surpassed Mitchell on transfers to finish in third place, behind Michael D Higgins and then-frontrunner Gay Byrne. Email “Crowley withdraws bid for Fianna Fáil's presidential nomination”. Feedback on “Crowley withdraws bid for Fianna Fáil's presidential nomination”.